Set Off a Great Fourth of July! Are the fireworks set off by that neighbor who always has a better party than you the only thing your guests ever "Ooooh" over? And the only thing ever "AAAAAH! "ed over is your own attempt to set off fireworks? You are not alone. If you're lacking a special something to make your event the envy of all, the ultimate solution is within your grasp! Let About Faces do the work, and we'll find entertainers whose skills bring smiles to everyone around them. What are you waiting for? Call 1-800-92-FUNNY today and show that neighbor just who's who in your neighborhood. What happens in July? Well, of course, the 4th of July is a huge party attraction. Hmm... Other than the Fourth, nothing much happens in July. But you can change that! 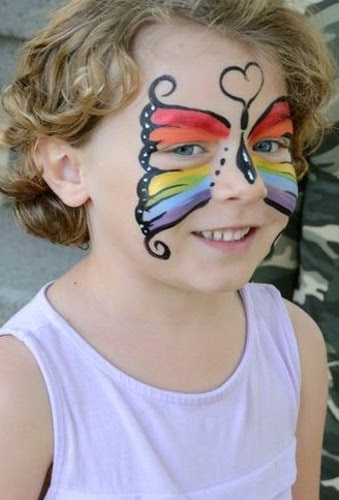 truly, does anything say "Summer BBQ" like a face painter? Pool parties become cool parties with a caricature artist. And to finish off the month, show your employees some appreciation with a company picnic and a magician or another one of our many amazing entertainers. We all know that July 4th was the day our Continental Congress officially adopted the Declaration of Independence, but do you know these other facts? John Adams and Thomas Jefferson both died on July 4, 1826, on the 50th anniversary of signing the Declaration of Independence. Adams' last words were "Thomas Jefferson still survives." In fact, Jefferson had died five hours earlier, after asking, "Is it the Fourth of July?" According to legend, on July 4, 1916, four immigrants had a hot dog eating contest to decide who was the most patriotic. Nothing says America like eating an excessive number of hot dogs. Americans eat more than 155 million hot dogs on Independence Day alone. Since the signing of the Declaration, American population has gotten over 150 million times larger (possibly due to all the hot dogs). The time has come to book entertainment! Call or email us with your request. Thanks for reading!